Find Better Ideas, Faster ® with a custom STEM trend report, our PRO Dashboard and 80+ categories of premium trend reports. 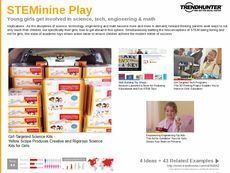 The STEM Trend Report focuses on educational toys, programs and products that direct youth in learning about science, technology, engineering and math. The report looks at the rising trend of girl-empowering toys and games that promote traditionally male activities like coding and robotics. Science kits and tech programs are advertised to both girls and boys, successfully doubling a target market while promoting gender equality. 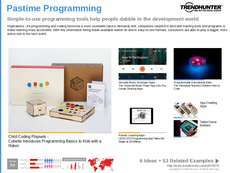 This report is beneficial to toy makers, game developers and marketing teams creating ad campaigns for such STEM industry-promoting products. It also will appeal to educators and educational retailers who are looking to stock their shelves with cutting edge games, kits and programs. The STEM Trend Report features various technology and design-oriented games that promote science and technology education and interest in youth.